Incandescent lamps are a simple thing. A bit of wire that gets very hot. It presents a very simple, resistive load to the electricity supply. The CFL on the other hand is much more complex as can be seen on the CFL autopsy page. The electronics required to make these lamps work present what is known as a reactive load, for a full explanation see “What is Power Factor?” a PDF document from Sylvania Lighting. In a very simple way there are two methods of determining power used, Watts, an actual measure of power and the units that you are charged for and VA, a measure of the voltage and current used and therefore what has to be generated to supply a piece of equipment. 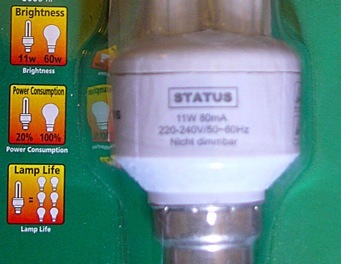 These two measures are the same for simple resistive loads like the incandescent lamp however they vary when a reactive load is presented such as a CFL. Generally with modern fluorescent lamps and gear the power factor will be high, typically 95% to 98% because large commercial users pay a higher rate for electricity if their installation exhibits a low power factor to the supply as the energy required to supply the installation is higher. So for a good fluorescent lamp and gear rated at 54 Watts will require 56.25 VA of generated energy. When we look closely at some CFLs we can see a current consumed figure as well as wattage, the lamp above for example consumes 80mA. This multiplied by the supply voltage will give a VA figure for this lamp of 19.2, compare this to the rated power of 11W! The lamp we autopsied was a 20W drawing 165mA. 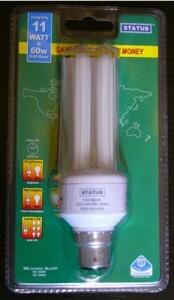 This one has a VA rating of 39.6, again almost double the rated wattage. Finally a new lamp from Ikea with a globe outer envelope, rated at 20W the current drawn is 0.174A giving a VA rating of 41.76 more than double the wattage! So what are the implications? Basically a lot of the arguments about energy saving must be questioned, as must comparisons of mercury exhausted by coal fired power stations in relation to mercury contained in CFLs. They just do not provide the real energy savings claimed for them.